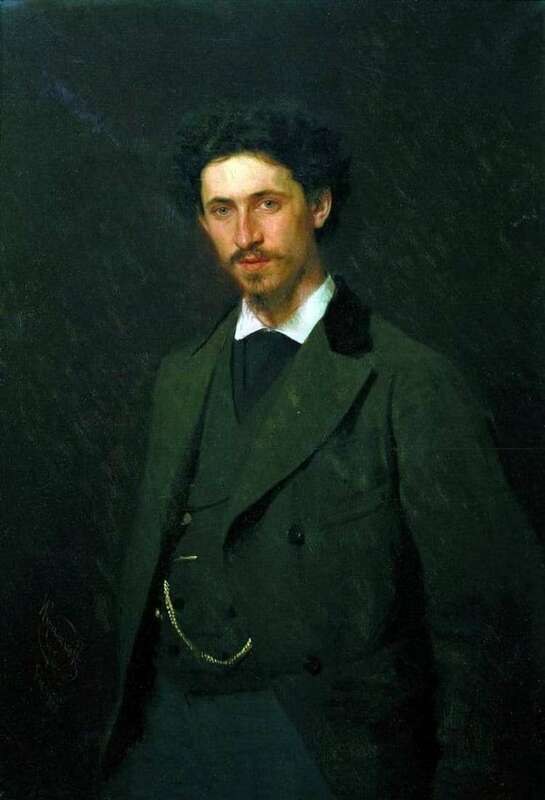 Artist Kramskoy was an outstanding portrait painter. The secret of his success was that he sought to capture not only the resemblance, but also to reveal, guess and convey the hidden, deep features of the individuality. Also, Ivan Nikolaevich gave his works a personal attitude to the person depicted, gave a subjective assessment of his nature. In fact, subtle psychological vision rarely let the master down. Close acquaintance with Repin, their frequent correspondence created the prerequisites for making a mirror of the soul from a simple porter. Kramskoy saw in his like-minded person elevated thoughts and feelings, great intelligence and sensitivity. He managed to portray the noble appearance of the artist without embellishment and without the help of his own thought-out. He saw her as clearly as he saw the intelligent features of the painter’s face. The author wrote not just a person, but a certain ethical ideal, which he considered a dear friend. Repin is shown standing to the waist. Curly brown hair beautifully framed face. His lips under his mustache remain motionless, but his eyes seem to be smiling. The look of the artist is soft and friendly. It seems as if the viewer is not looking at the hero of the portrait, but the hero at the viewer. At the same time, he knows some secret and gently smiles at this to himself. Probably, this reflects the feeling of warm friendship and harmony that reigned between the creators. Gamma shades of canvas mostly dark. These are black, gray, dark brown colors that complement each other. Light colors are used only for writing leather and white collar shirt. The artist painstakingly achieved physical similarity by carefully writing the relief of the head, the shape of the face, as well as skilful reception of light and shade – a soft and more pronounced contrast, midtones and smooth transitions of light and dark shades. Contemporaries testified to the rarity of the graphic portraits of Kramsky with the model. The artist achieved this thanks to an accurate pattern, elaborate topography of the head and face, modeling of a light and shade – contrasts, half tones, barely perceptible transitions of light and dark. Especially clearly manifested organically inherent Kramsky property – he knows how to see in the person depicted sublime, noble, even heroic, but not brought from the outside, composed and contrived. The achievement of physical similarity is far from the task of the portrait painter. Kramskoy argued the need for the portrait to express the “thought” of the artist about the person depicted, the author’s judgment about him. Therefore, in the best works of Kramskoy, a thoughtful, long study of the model, the creation by the artist of the concept of the image of the portrait, preceded the work on canvas. Kramskoy sought to identify the complex spiritual life of a person, to the disclosure of the most significant, deep, not lying on the surface of the properties of the person portrayed. The main thing for him is the expression of the ethical ideal.